2019 will be my 26th Christmas Season of creating Personalized Christmas Stockings for kids of all ages, all over the world. THANK YOU to all of my loyal customers that come back year after year and order matching stockings. Win Christmas Stockings, Follow Aunt Joys on FACEBOOK and enter my FREE STOCKINGS FRIDAYS give-a-way. 25 Classic Stockings and 25 Mini Stockings will be given away from Labor Day to Christmas to celebrate my 25th Christmas season. 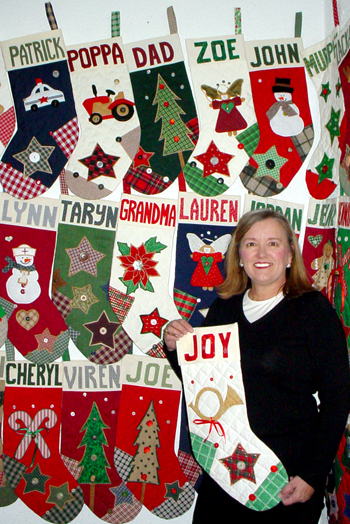 Custom Orders are Christmas Stockings made-to-order just for you. You choose the Color of the Stocking, the Stocking Design, the Toe Points to the Right or Left (as you are looking at the stocking), and the NAME to personalize. Custom Orders take 10-15 days for delivery. As we get closer to Christmas the delivery times are longer. I guarantee Christmas delivery for all order placed before Thanksgiving. I make stockings all year long so you can order anytime. SHIPPING & HANDLING — I SHIP WORLDWIDE. $8 per ORDER, so order as many as you like. I ship most packages via US Postal Service PRIORITY MAIL. Orders over $200 receive FREE shipping.